Who can use DAEnetIP2 Manager ? DAEnetIP2 Manager is SNMP v1 configuration/control/monitor utility for DAEnetIP2. It supports most OIDs of the controller but not all. 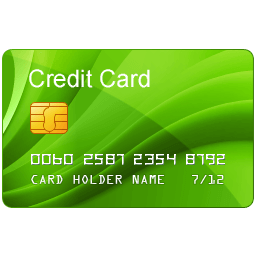 In this page they are described all the features of current version. It works as sending/receiving snmp requests to the target DAEnetIP2 controller. The page does not describe the DAEnetIP2 features, but only the software. For full description of the DAEnetIP2 features, you can refer to the DAEnetIP2 web page or the user's manual. DAEnetIP2 Manager may be used by anyone who has at least one of DAEnetIP2 devices from the current version supported list. 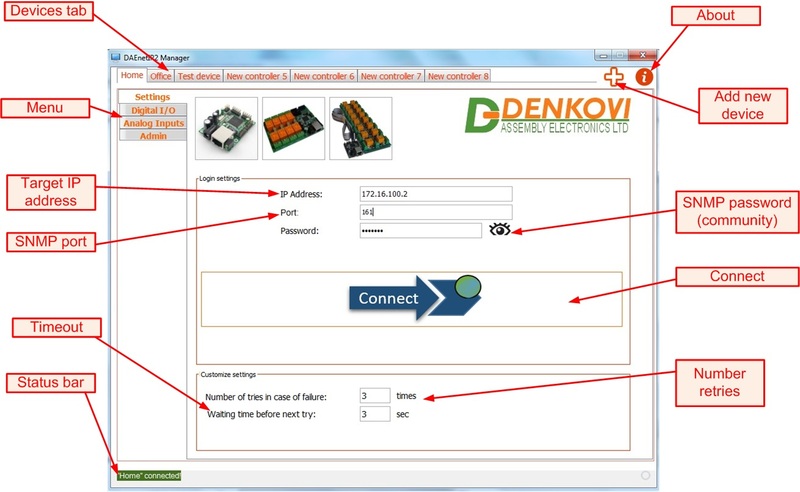 Devices tab - here are located all available DAEnetIP2 devices (controllers). About - information about the current software version. Add new device - add new DAEnetIP2 device. Menu - available DAEnetIP2 settings sections. Target IP address - the IP address of the DAEnetIP2. It can not be domain name, but only IP address. SNMP port - the SNMP (UDP) port of the target DAEnetIP2 device. SNMP password community - the read-write snmp community. Connect - this button just tests if there is connection with the target DAEnetIP2 device. Timeout - determines how many seconds to wait before next try to execute the query. Number retries - this will set the number retries for each snmp query in case of unsuccessful execution. Status bar - indicates the status (successful or not) of each command. 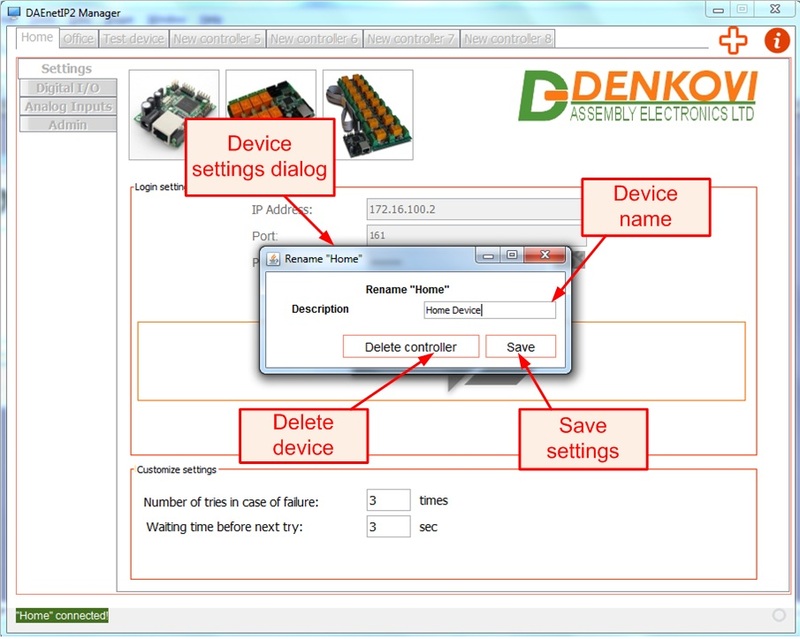 Devices settings dialog - it can be invoked after right click with the mouse over the DAEnetIP2 device on the device tab. Device name - this is the description of the DAEnetIP2 device. This parameter is not stored in the DAEnetIP2 memory but on the computer disk. Delete device - deletes the selected DAEnetIP2 from the working list. Save settings - save the settings. I/O state - indicates the state of each I/O. It can be ON (High level) or OFF (Low level). If it is input it can not be set, but only get. If it is output it can be get and set. I/O name - the name (description) of each I/O line. Set all i/o types - set the all the i/o types (if line is input or output). This will cause device restart and that's why the procedure may takes longer than usual. I/O type - each i/o line can be defined as Output, Input with pull-up and Input with pull-down. I/O settings - click this to adjust the i/o line settings. 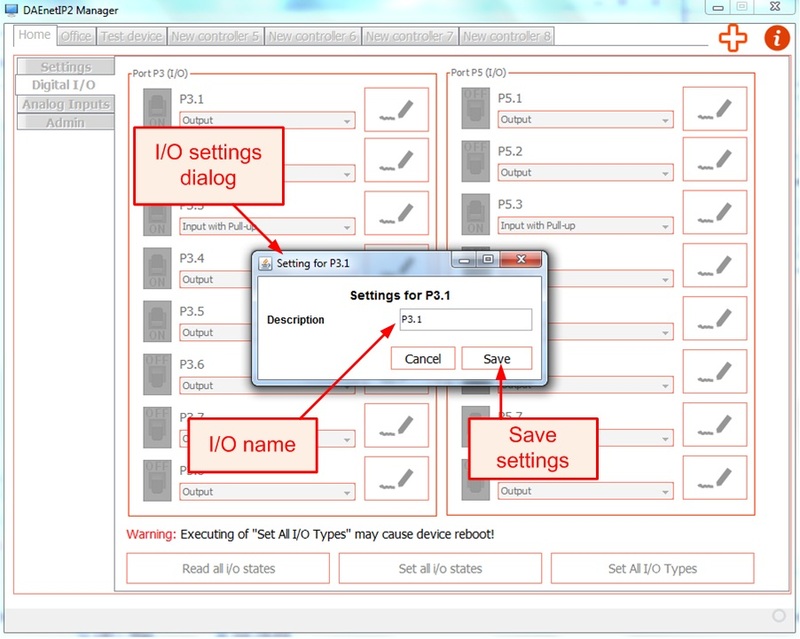 I/O settings dialog - these parameters can be adjusted for each i/o line. I/O name - the name (description) for each i/o line. This parameter is not stored in the DAEnetIP2 memory but on the computer disk. Save settings - this will save the settings. ADC name - the name (description) for each ADC channel. ADC value - the value returned by the snmp get request from the DAEnetIP2 controller and the scaled (linearized) value in given units. ADC INV enabled - the INV parameter for the ADC mode (for more information please refer to the DAEnetIP2 description). ADC mode - available ADC modes: None, Low, High, Low/High, ACC (for more information please refer to the DAEnetIP2 description). 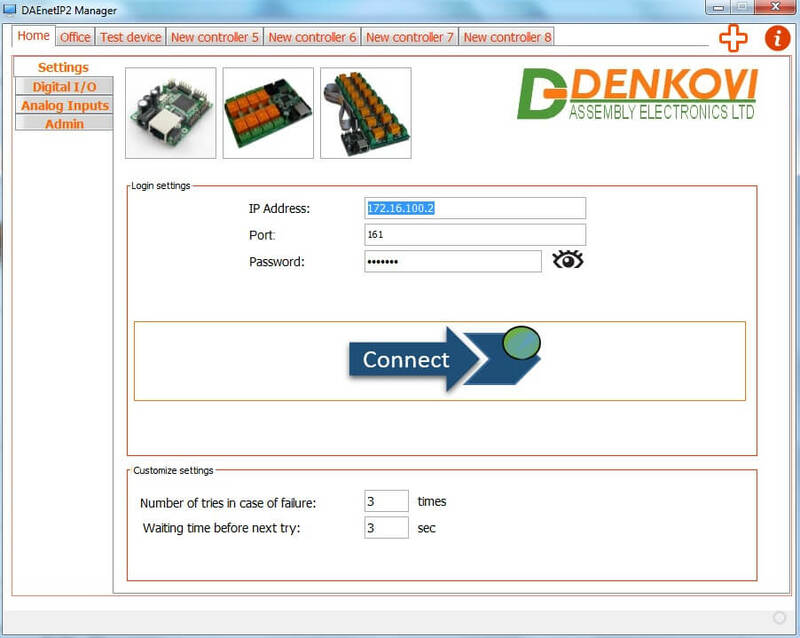 Read all input values - reads all the ADC parameters from the DAEnetIP2 controller. LT in ADC units (divisions) - this is the Low Threshold parameter in ADC units. 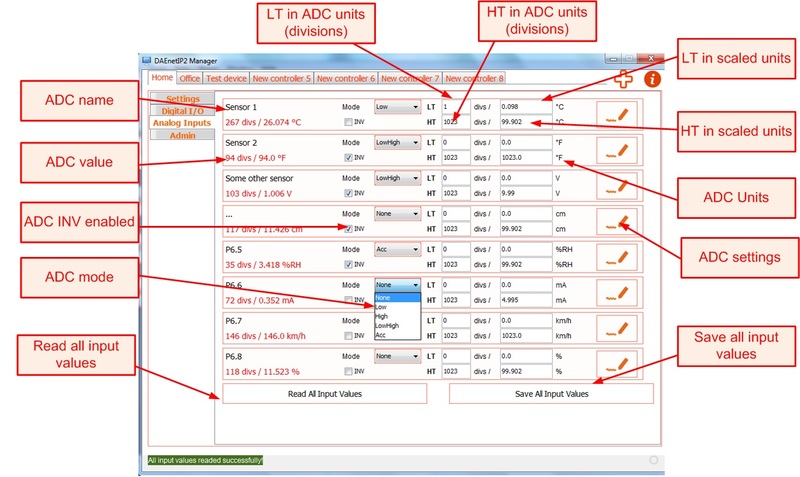 HT in ADC units (divisions) - this is the High Threshold parameter in ADC units. LT in scaled units - this is the Low Threshold parameter in scaled (linearized) units. HT in scaled units - this is the High Threshold parameter in scaled (linearized) units. ADC units - the units used for scaling (linearization). ADC settings - click this button to adjust the ADC settings. Save all input values - saves all the ADC values into the DAEnetIP2 controller. 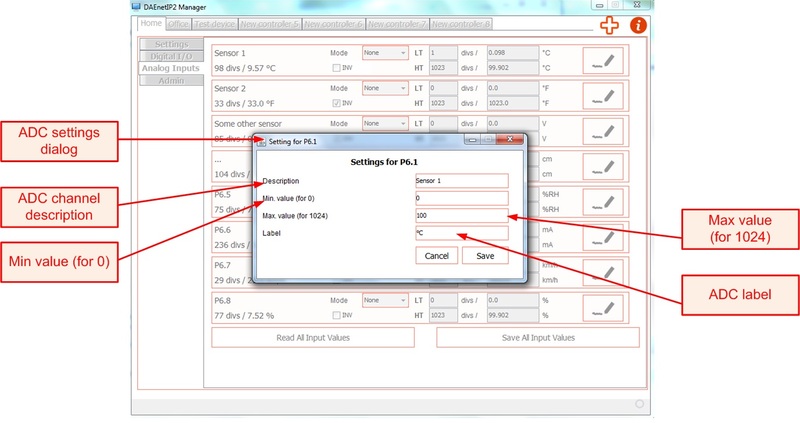 ADC settings dialog - these parameters can be set for each ADC channel. ADC channel description - this is the name (description) for each ADC channel. This parameter is not stored in the DAEnetIP2 memory but on the computer disk. Min value (for 0) - this is the value (in scaled units) when the ADC value is 0. This parameter is not stored in the DAEnetIP2 memory but on the computer disk. Max value (for 1024) - this is the value (in scaled units) when the ADC value is 1204. This parameter is not stored in the DAEnetIP2 memory but on the computer disk. ADC label - this is label after the scaled units. This parameter is not stored in the DAEnetIP2 memory but on the computer disk. 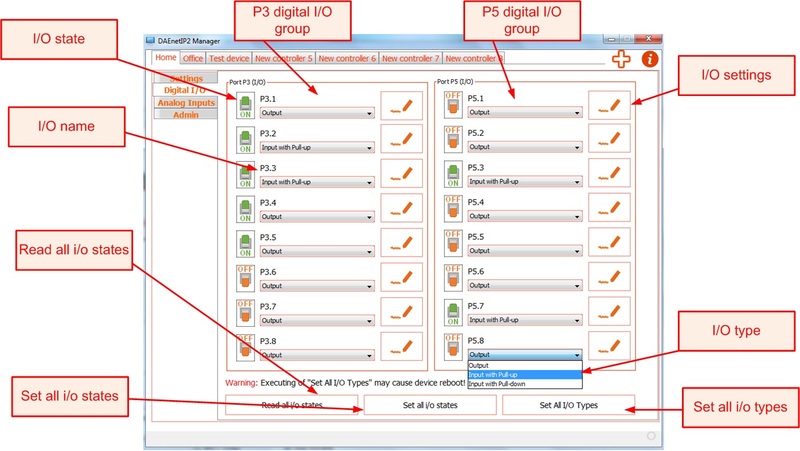 IP configuration group - IP settings. IP address - IP address of the DAEnetIP2 device. Default gateway - the gateway. VLAN ID - VLAN ID (for more information please refer to the DAEnetIP2 description). 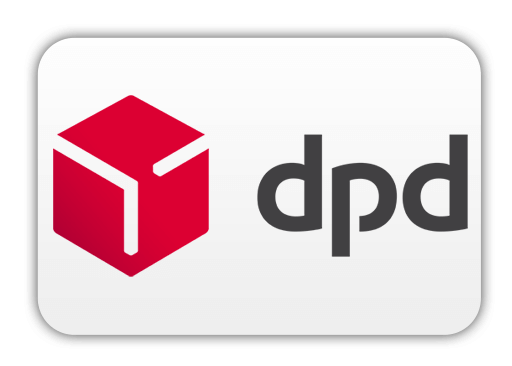 DHCP client - enable disable DHCP. 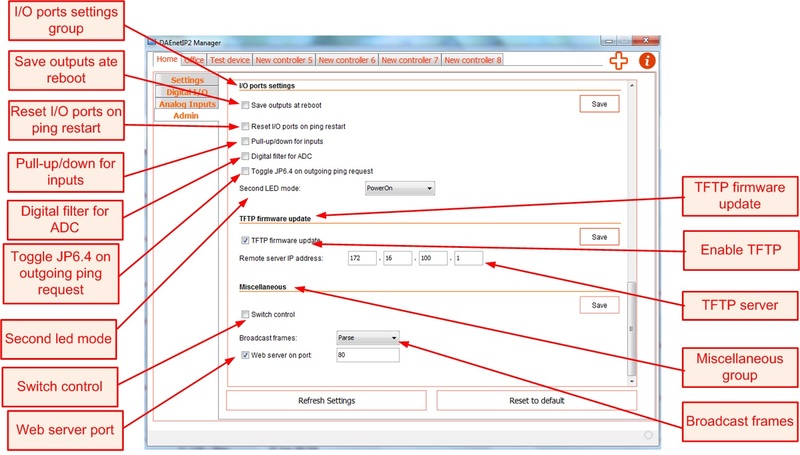 Tagget VLAN mode - for more information please refer to the DAEnetIP2 description. MAC adress - the MAC address of the DAEnetIP2 device (read-only). Access MAC address 1 - for more information please refer to the DAEnetIP2 description. Access MAC address 2 - for more information please refer to the DAEnetIP2 description. Available MAC interfaces - lists all MAC addresses available (for user conveince). 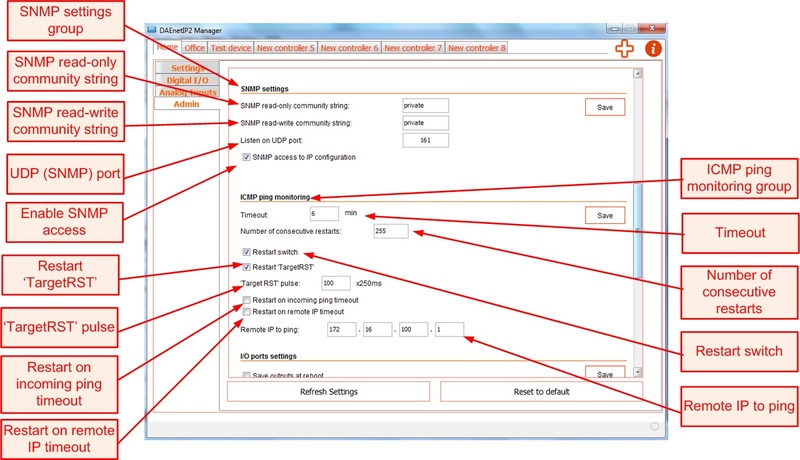 SNMP settings group - snmp settings. SNMP read only community string - the read-only password. SNMP read-write community string - the read-write password (used in this software for access). UDP (SNMP) port - the SNMP listening port (can be changed). Enable SNMP access - this enables/disables the snmp access. I/O ports settings group - settings for the I/O. Dave outputs at reboot - if this is checked, each time when outputs are changed, they are stored into the EEPROM. Be careful, the EEPROM write/erase cycle number is limited, so if not necessary do not check this. Reset I/O ports on ping restart - if this is checked, the i/o ports will be reset on ping restart (for more information please refer to the DAEnetIP2 description). 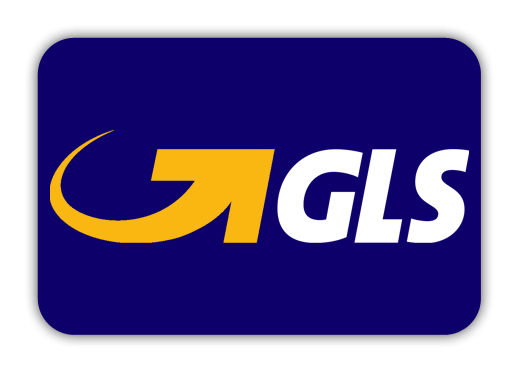 Pull-up/down for inputs - global enable/disable flag for the pull-up/down resistors for inputs. Toggle JP6.4 on outgoing ping request - toggle JP6.4 on outgoing ping request (for more information please refer to the DAEnetIP2 description). Second led mode - it can be: Power ON, PingIn, PingOut, Ping Both, DHCP Valid IP (for more information please refer to the DAEnetIP2 description). TFTP firmware upgrade section - sets the parameters for TFTP. Enable TFTP - this enables/disables TFTP. TFTP server - the IP of the TFTP server. 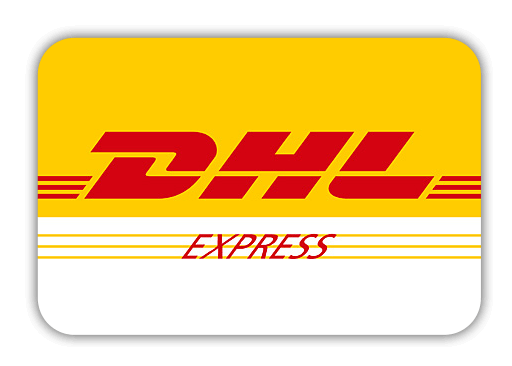 Switch control - (for more information please refer to the DAEnetIP2 description). Web server port - the HTTP port (can be changed). Broadcast frames: Drop or Parse (for more information please refer to the DAEnetIP2 description).